The truck battle between the Detroit Three has intensified since General Motors Co. released its fresh and new 5 star government safety rating. 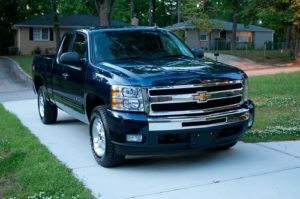 General Motors Corp. (GM) earned the 5 star safety rating for its new 2014 GMC Sierra and Chevrolet Silverado, which was newly redesigned. GMC’s latest creations share many of the same features, including the same components and platform. The vehicles earned GM the National Highway Traffic Safety Administration’s 5 star Overall Vehicle Score given for the safest vehicles. 5 stars is, of course, the highest possible score that can be achieved. It signifies the very first time any pickups have achieved such a feat since before the regulatory group revamped its New Car Assessment Program in 2011 for the model year. Just for a comparison, the Ram 1500 and Ford F 150 have both earned 4 star ratings. The 5 star rating also does apply to the premium Sierra Denali and Silverado High Country models. This gives GM the right to brag in an escalating battle of pickup trucks, going on right as customers are flocking to the showroom floor. Safety is of utmost importance to car buyers and truck buyers. Obviously this makes safety very important to GM as well, as manifested by this new 5 star government safety rating. The general director of vehicle crashworthiness and safety at GM, Gay Kent, made it clear that Sierra and Silverado are meant to set a benchmark for safety in pickup trucks. This is because both of the models offer a wide variety of advanced features that are designed specifically for the protection of the occupants in all phases of the collision: before, during and after. High strength steel has been utilized for the pick ups. Amazing technology like lane departure warning, rear vision cameras and an amazing forward collision alert are available to keep drivers as safe as possible. In addition to this, fully boxed frames also aid in the overall safety of the vehicles. Full size pickups were redesigned by GM for the very first time in 7 years. This gave the automaker based out of Detroit more ammunition in a heated competition between Chrysler, Toyota and Ford. The North American Truck of the Year award was won by Chrysler’s Ram in January. A redesigned model of the F series pickup truck is expected to be rolled out by Ford next year. Experts in the industry are stating that pickup truck sales are increasing due to a recovering housing market, strength in the energy industry and pent up demand. Looks like it is a pretty good year for GM.